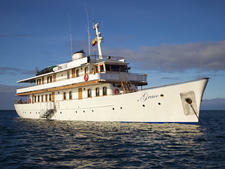 Evolution, a cruise ship and expedition vessel, was built in Japan and sails seven-night itineraries in the Galapagos. The 32-passenger, 655-ton ship offers three suites, eight premium staterooms and five deluxe staterooms, all with private bathrooms. With 18 crew members, two naturalist guides, one doctor and one cruise director, sailings are 54 people onboard at maximum. Passengers can visit a common lounge with a bar and facilities for lectures, slideshows and films. A sky lounge on Albatross deck features another bar and plenty of room for relaxation with a view. The ship has four decks -- Albatross, Beagle (main deck), Comorant and Dolphin. You'll find a Jacuzzi with lounge chairs for sunbathing and plentiful outside deck space at the bow of the yacht. Inside and alfresco dining areas are available onboard, and breakfast, lunch and dinner are served buffet style. For family cruises, Evolution's Kids Club organizes activities such as star-gazing and movie nights, and child-oriented guides provide tailored learning activities and keep kids' expedition journals. A PlayStation console is available in the library as well as a wide range of board games and movies for children. Children's menus are provided during family cruises. The yacht -- named Grace after the princess -- offers two Master Suites, two Twin Suites and five Premium Staterooms of up 200 square feet with private facilities.